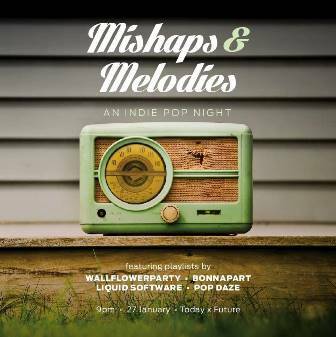 Why you should go: It's an indie pop night featuring playlists by Wallflower Party, Bonnapart, Liquid Software, and Pop Daze. The gig will also double as a benefit event for writer Luis Katigbak. For every rum cola and vodka-7 you buy, 50% of the sales will be allocated for Luis Katigbak. So get sloshed and help someone out. The organizers will also be passing a hat! 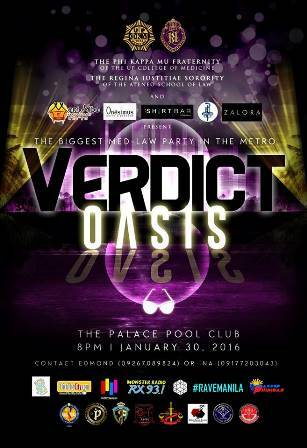 Other details: Party starts at 9 p.m. For inquiries or table reservations, contact 0928-520-9102. Why you should go: Aside from headliners Bullet Dumas and Ang Bandang Shirley, there will also be long sets by Short Waits, Wide Smiles, Warm Hugs, Broken Hearts, and Everything Will Be Okay. Other details: Gig starts at 9 p.m. Pay P200 to get in. Why you should go: Music and spoken word in one album? 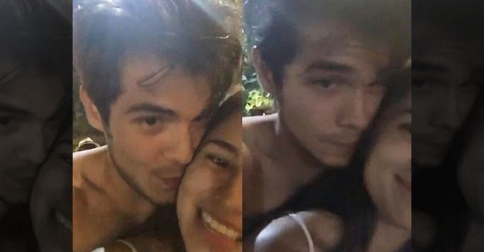 Sud and Words Anonymous will be releasing their collaborative album, featuring eight music tracks from Sud and and eight tracks from Words Anonymous, inspired by songs from Sud. Celebrating this unique release will be Autotelic, Jensen and the Flips, Miles Experience, TMac Vibes, Jess Milner, Words Anonymous, and Sud. Other details: Doors open at 8:30 p.m. Entrance is priced at P200, while the album costs P450. You can also pay P550 for the entrance and album package. 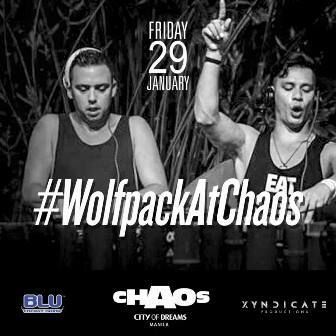 Why you should go: One of the world’s top duo DJs will be visiting Chaos Manila this Friday. Bring out your inner party beast with Wolfpack, together with local support from DJ David Ardiente and Marc Marasigan! Other details: Be there by 11 p.m. For VIP table reservations, contact 0917-381-3398 or e-mail ChaosTableReservations@cod-manila.com. 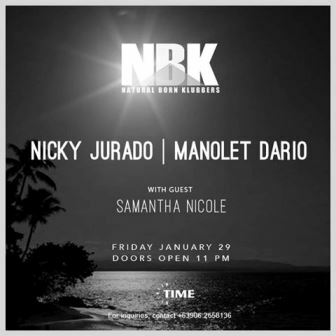 Why you should go: The Natural Born Klubbers are crashing the party at TIME yet again, this time featuring Nicky Jurado and Manolet Dario with special guest Samantha Nicole. Other details: Doors open 11 p.m. Regular door charge P500. For inquiries or reservations, contact 0906-265-8136. 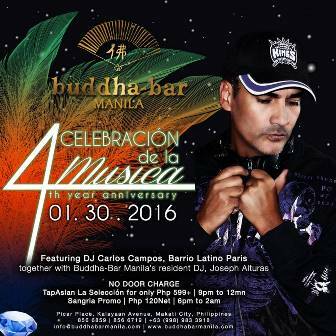 Why you should go: Buddha-Bar Manila is turning four! Salsa the night away with Celebraciòn de la Mùsica (Celebration of Music), a festive Latino night event with international guest DJ Carlos Campos from Barrio Latino Paris. He will be playing his music together with Buddha-Bar Manila's resident DJ, Joseph Alturas. And to add up to the hype, they will be unveiling the luxury car to start up their annual car raffle promo. Other details: Doors open at 6 p.m. No door charge! For reservations, contact 856-6719, 856-6859, 856-5738 or 0998-983-3918. 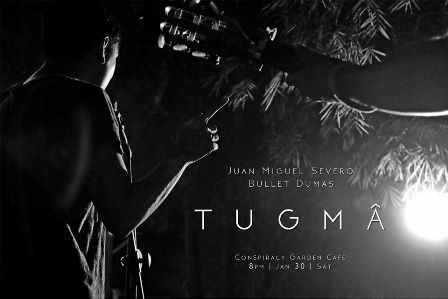 Why you should go: Bullet Dumas and Juan Miguel Severo join forces for a night of music and poetry at Conspiracy Garden Café. This kind of collab doesn’t happen every day so be sure to catch it! Other details: Event starts at 8 p.m. Tickets are at P400. Ticket-selling starts at 6 p.m.
Why you should go: Now on its eighth year, the Phi Kappa Mu Fraternity of the UP College of Medicine and the Regina Iustitiae Sorority of the Ateneo School of Law are hosting the biggest med and law party in the Metro. Lose yourself in the Oasis at the Palace Pool Club! Other details: Gates open at 8 p.m. Tickets are priced at P450. For inquiries, contact Edmond at 0926-708-9824 or Ina at 0917-720-3043. 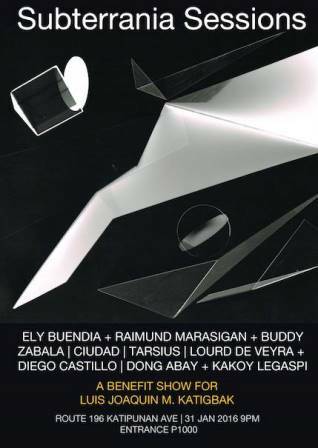 Why you should go: The Subterrania Sessions is a benefit gig with an incredible lineup of musicians such as Ely Buendia, Raimund Marasigan, and Buddy Zabala; Ciudad, Lourd de Veyra and Diego Castillo, Tarsius, Dong Abay and Kakoy Legaspi. 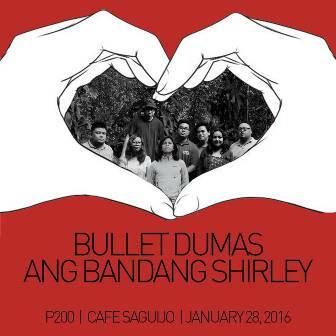 Proceeds from the gig will go towards writer Luis Katigbak’s medical fund. Other details: Gig starts 9 p.m. Entrance is P100. 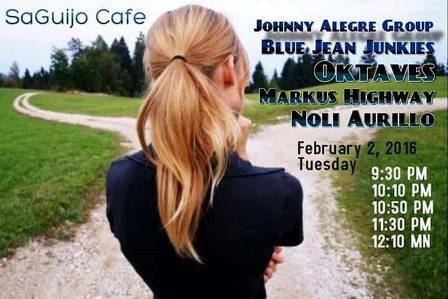 Why you should go: Beat the blues this Tuesday with Blue Jean Junkies, Johnny Alegre Group, Markus Highway, Noli Aurillo, and Oktaves. Other details: Gig starts at 9 p.m. Entrance is P250, inclusive of one drink.